Lucy and Bayla are having a fabulous weekend. Lots of company. Loads of fun. And I’m 100% grateful for their good health, their happiness and our beautiful life together. Still, sometimes I get jealous. I don’t want to but I do. It washes over me. And sticks. Like heavy, poisonous mud. I get jealous of other families’ carefree lives. Their athletic endeavours, financial security, freedom, vacations, hobbies and warm relatives. If I could cut out these feelings as easily as I cut out foods, I’d be set. I shaved for the first time today. Never thought that’d be exciting news. I’ve had a lot of firsts since chemo ended, but the only one to make me cry was my first visit back to The Oat. And I cried just as hard at my second. The Wild Oat was our family’s cozy oasis — every day — for more than three years. Its earthy attitude, funky, friendly staff and unbeatable organic coffee, baked goods and meals were well worth the line-up each weekend for breakfast. Its mellow, homey atmosphere and steaming espresso machine sang backup each weekday morning as Mark and I recorded our daily discussion for Just One More Book. We knew the staff. We knew the customers. All four of us felt completely at home. Right up to my diagnosis. I cry for the pre-c freedom The Oat represents. For our lost podcast. For my lost employment. And for the carefree morning “dates” that Mark and I enjoyed each day before work. Still, happiness is The Wild Oat. Last week we took up a game called Rat-a-tat-Cat. Now we play it almost ALL the time!! Do you know the feeling when you can’t imagine when this certain thing hasn’t been invented, well, that’s what we feel like about Rat-a-tat-Cat. Mind-reading got me through my young life — constantly scanning faces, words, inflection and situations for the teeniest clues of disapproval, displeasure or impending danger, and then adjusting my actions accordingly. It helped me negotiate volatile and irrational authority figures. It likely improved my software analysis and design. But I’m learning that, when dealing with fairly decent human beings, my hyper-vigilance often backfires. Disguised fear may look like dismissal. Extreme sympathy may be disguised as awkward rudeness. Colossal insecurity may be disguised as arrogance and (in the grand scheme of things, harmless) hostility. And that, disguises or not, I’m safe. So, thank you, Mind-reading, for getting me to safety. Peanut butter causes cancer* ? I’ve been blissfully binging on this delicious protein while trying to avoid sugar and dairy. I may as well have been drinking red wine. * According to Food For Breast Cancer. I’m drifting these days. I’m distracted and almost dizzy. My limbs and digits are groggy and stiff. I’m moving slowly. I’m thinking slowly. Maybe it’s a side-effect of being drug-free. I think of cancer as a teacher that was not invited but has come to my house to visit from time to time nonetheless. It sits on my left side whispering insistent questions that I cannot answer but still must explore: Who am I when I stop doing? What have I come here to give? What is unfinished for me to learn, to experience? Am I leaving a legacy that enables others to live bigger lives than I have? I’ve completed the first five of my 30 radiation sessions. The weather has been unseasonably cool and it’s been threatening rain all week, so my 45 minute walks to and from the hospital have been pleasant. I’ve enjoyed having a destination each day. The daily commitment has forced me to pick up the pace of my sloppy stay-at-home routine. And, given that my post-chemo body is too sore to jog and my hole-fallen-into upper body is too sore for my 30min exercise tape, the long walks are perfect. 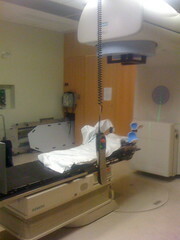 The radiation targets my entire upper right side — including my neck and portions of my back. I’ve been slathering myself with Glaxal Base and Calendula lotion three times each day in hopes of keeping my skin on long enough to avoid the infamous blisters and weeping sores. Fingers crossed. All my life, I’ve resisted shortcuts. — Lois Tschetter Hjelmstad, 1990. Fine Black Lines: Reflections on facing cancer, fear and loneliness.